The Kickstarter for Slower Than Light has come up raising only about a third of its $30,000 goal. While I am disappointed that I did not make my goal, and therefore won’t be able to complete Slower Than Light this year, I am deeply appreciative of all the support I did receive, and gratified to know that there is interest out the for a sub-light 4X game. I want to thank everybody who pledged to the Kickstarter, who posted articles, and who commented on the blog and the campaign webpage. I’d like to thank everybody who gave me suggestions for game mechanics, flavor, and tips on running a Kickstarter campaign. In particular, I’d like to thank Mason Reed for his thoughtful feedback on a lot of the flavor content and physics in STL, UsF for numerous comments and encouragement offered during the campaign, and Brian Rubin at SpaceGameJunkie.com for a great podcast and coverage. With the failure of the Slower Than Light Kickstarter, I now have to take real consideration of how I can continue work on Slower Than Light. For the moment I need to find a new job that will support myself and my family. The nature of the work I eventually find will likely play a major role in when and how Slower Than Light finally makes its way to release. Depending on what my circumstances are, I may continue working on Slower Than Light directly, or I may work on small projects that use components of the engine. I have been repeatedly asked if I plan on running a second crowdfunding campaign for Slower Than Light. I have no plan to do so at this time. The game needs to come much farther before I would attempt another Kickstarter. If a second campaign does begin to materialize, I will be starting the pre-Kickstarter marketing campaign much earlier, and I will certainly be reaching out to those people who supported me on this attempt. Once more, I want to extend my sincerest thanks for everybody who supported Slower Than Light during this campaign. This project may need to go dormant for a while, but you have ensured that it will not die. I am immensely grateful for the validation this experience provided, and it has refreshed my faith that Slower Than Light is a project worth seeing through to completion. This is also the final weekend of the Slower Than Light Kickstarter! Although the project may not fund, the closer it gets to funding, the more likely it is to get developed anyways. Expect some new stretch goals tomorrow. Also, a great podcast with SpaceGameJunkie.com went up yesterday, almost entirely discussing Slower Than Light and the Kickstarter. Be sure to check it out! Today’s video covers how resource extraction and production works in Slower Than Light. In this video I quickly go through the Research and Development model in Slower Than Light. There’s a week plus a few hours until the Slower Than Light Kickstarter ends, and this week is going to be full of content. Tomorrow at 23:00 EDT, I’ll be the guest on SpaceGameJunkie’s podcast (streaming via Twitch.) Also starting tomorrow, there will be a video a day dedicated to each of the major mechanics that have been discussed on this blog and linked on the Kickstarter page. I look forward to talking with many of you over the coming week, and sharing more and more of my vision for Slower Than Light. Thank you all for your support so far, and I look forward to a very exciting final week. I’m starting to get a lot of questions about what happens to Slower Than Light if the Kickstarter fails to fund. From the perspective of my desire to do that project, I expect I’ll loose a little enthusiasm for the project due to the perceived (but not necessarily accurate) vote of no-confidence from my potential players. That said, I recognize that I’m asking for quite a bit of money for what is decidedly a niche game. If, all told, less than 250 people back the project, I’ll probably call the model I’m trying to publish on a bust — the game price was set at $10 because I thought the novelty value of the mechanics was worth at least that to many people, but after the very exhaustive interaction I’ve had with a number of potential backers, I think that is less of a factor than I thought it was. It would mean that the game is more in the realm of a Train Simulator, where in order to make back the cost of the game over the potential user base, it has to be priced more in the AAA bracket. I don’t think STL can be produced at that quality level and still take anything other than a massive loss. If more than 250 people or so back the project, but we still fail to fund, STL will still get de-prioritized. I have financial responsibilities I need to keep in mind, and if the Kickstarter fails, I’ll need to start taking immediate steps towards getting a reliable income flow into my life. That probably means finding a new job, and given that I take employment extremely seriously and give my employers my all, that almost certainly means that the Slower Than Light’s development will return to a crawl in my spare time. Either way, there will be no attempt to refund for at least the foreseeable future. I am confident that Slower Than Light, as it exists today, has gotten a fair shake at the amount of media attention it is going to get. Most of the site rejections I have gotten have cited the lack of artwork and polish on the project, which I find disappointing given the project’s state and Kickstarter’s stated goals, but I can accept that the current graphics don’t stand up to the fully-rendered 3D most gaming sites like to put on their front-page columns. While I will never fully give up on Slower Than Light no matter what, a failure to fund in 10 days will mean, in all likelihood, that this project won’t see the light of day for years. That would make me very sad, but given the immense investment of time it represents, I cannot afford to complete it without the Kickstarter’s funding. A key element of Slower Than Light is personalities, or the NPC characters that will be making decisions on the player’s behalf when their ships or colonies are out of practical contact with the Homeworld. Also of concern are populations, which represent the total population of a settlement, be it a colony or a spacecraft with a large civilian complement (such as a generation ship.) Populations and personalities affect each other based on government types. Both personalities and populations have political leanings. At present the political scale has two axes. The first is Isolationism/Expansionism — whether the person or population prefers policies that maintain their colony’s present size and focuses resources on improving it, or if they prefer to use those resources to expand their influence in hopes of getting more resources and improving their situation that way. The second axis is Empire/Homerule. This value determines whether the person or population prefers to coordinate with other colonies and the Homeworld towards their goals, or if they prefer to act strictly in the best interests of their colony. Each manned entity (be it ship or colony) has a personality in charge, called the Executive. Decisions made for that colony depend entirely on the Executive’s political values. When a new ship is created, the Executive for the nearest populated place makes the decision for who should command that ship, and it will generally match the Executive’s political alignment. If the nearest populated place is the Homeworld, the player chooses the commander’s political alignment. Populations are complex entities that consist of a collection of subpopulations. These subpopulations each have a number of individuals in them, they consume a certain amount of energy per capita (which can be loosely read as their economic status) and they have a political alignment. Populations exercise no direct control over the decisions made for a colony, but they may exercise control over who the executive is. When a leader falls out of power, an “election” is held for a new leader. How that election is held depends on the government type. In a democracy, the new executive has the political alignment of the largest subpopulation by population count. In a dictatorship, the new executive has the same political alignment as the old leader. In an oligarchy, the new executive has the same political alignment as the subpopulation with the highest total energy consumption, and so on. In all of these cases, upsets are possible, but unlikely. If the population and the executive’s political alignments fall far enough apart, for a long enough period, there may be a revolution. A revolution is a chance-based event in which some subpopulations rise up against the others, and a result weighted by the total energy consumption of each side decides if the revolution is successful. If it is, a new government type is selected, and a new leader immediately placed in power. That’s a quick summary of the political system in Slower Than Light. With only three types of entities, it is quite simple, but I feel it provides considerable depth of play. The ramscoop, or ramjet, is a clever bit of design in potential interstellar travel that takes advantage of the fact that space isn’t actually a vacuum. One of the biggest problems with interstellar voyages is the amount of fuel required — a pure rocket needs to carry all the fuel it needs to accelerate to interstellar speeds, and all the fuel it needs to brake into orbit at its destination. For all but the most powerful fuels (such as antimatter) this means carrying many times the spacecraft’s dry mass in fuel. The ramscoop takes advantage of the fact that there is plentiful, if very, very thinly spread hydrogen in both the interplanetary and interstellar mediums. If you put a very large collector on the front of your spacecraft to scoop up this hydrogen, and you use that hydrogen to produce thrust, then you only need to carry a tiny fraction of the amount of fuel you would normally require. The problem with this design, of course, is that there is so very little hydrogen in space that you would need to go fantastically fast or have an enormous collector to make the ramscoop work. Indeed, you would want both. So how do we manage that? The primary component of a ramscoop-driven starship is the scoop itself. Because building a scoop thousand of meters, or even thousands of kilometers in diameter isn’t very feasible, most designs call for a magnetic scoop that collected ionized hydrogen. The hydrogen is taken aboard the ship and fed into the ship’s engine (usually a fusion rocket of some description) in which it fuses, releases energy, and is exhausted out the back, creating the thrust that drives the ship forward. Now, there are a number of issues with the ramscoop. When the ship collects fuel from the ramscoop, it necessarily also picks up some fraction of that fuel’s momentum. The ship gets thrust by throwing that same fuel out the back, which means that even at its most efficient, the ramscoop can’t go much faster than its engine’s exhaust velocity relative to the medium it is traveling through. Larger scoops will allow it to operate in lower densities of interstellar hydrogen, but if it needs to take in a gram of hydrogen every second, regardless of how wide a net it casts and how fast it needs to be going to collect that hydrogen, it has to make sure it goes out the back faster than it hit the front. The less the scoop has to change the velocity of the hydrogen to get it to fuse, the more efficient the scoop, but the drag ratio will never get very close to zero. This momentum-collecting attribute of the scoop has some useful side-effects, though. When exiting a star system, the scoop can be deployed without firing the engine, and solar wind will produce a force carrying it out of the solar system, much like a solar sail. When it comes time to brake when arriving at a destination, the scoop can also be run without the engines, and intentionally allow the drag force to slow the spacecraft. Ramscoops are tricky to use, but if you can work with their strengths and minimize their shortcomings, they can prove to be powerful additions to interstellar missions either as primary or auxiliary propulsion systems. Time to go over how colonies and manufacturing will work in STL. As we discussed before, the core of the economy in Slower Than Light is energy — it is the basic resource that is converted into everything else. Converting energy into other resources, though, has a couple of steps. The first step is converting that energy into raw materials, usually metals, radioactives, and organics. Figure 1: Here we see the metal resource curve for a planet. At the left is the amount of easily collected metals. At the right are the metals that require considerably more energy to collect. Each planet has a resource curve for each resource it supplies. The curve provides different amounts of the resource that are available for differing amounts of energy used to recover it. In the example in Figure 1, we see the energy requirements collecting metal using 3 different kinds of facilities. 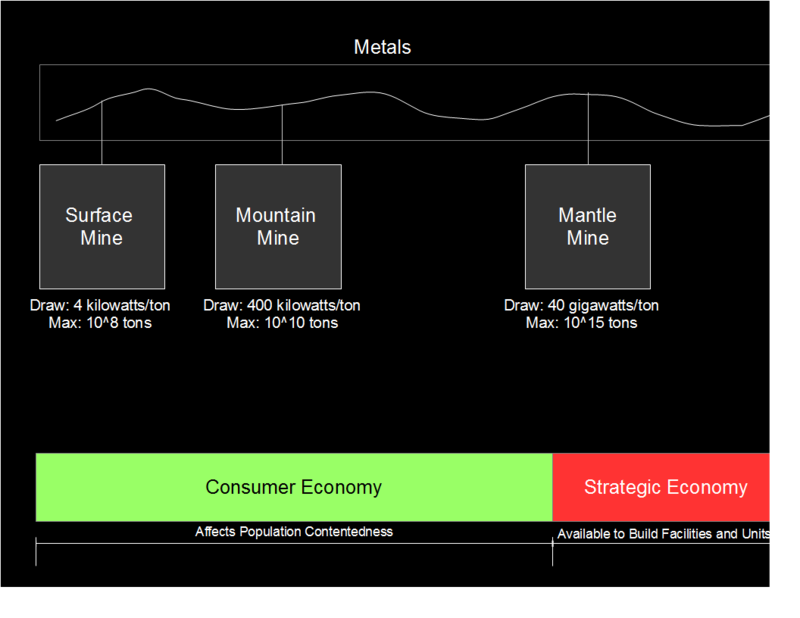 A Surface Mine requires very little energy per ton of metal created. A Mountain Mine requires more, but has a higher capacity. A Mantle Mine, which goes deeper than any mine we have today, has the potential to reach colossal amounts of metal, but is extremely expensive per ton to access. Figure 2: This Nuclear Engine is being assembled on a planet where Metals and Organics are relatively cheap to acquire, but Radioactives are expensive. 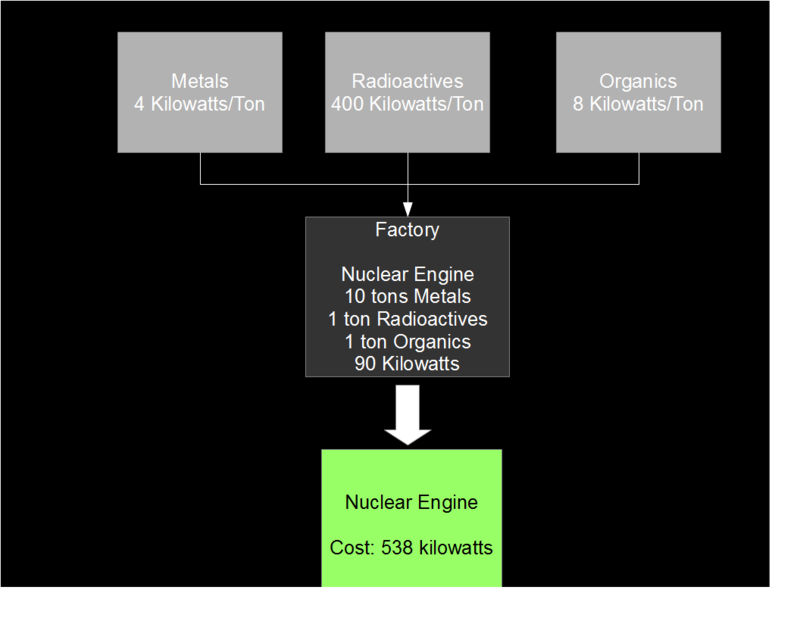 By multiplying each ton of material by the energy cost, and adding the factory’s energy requirements, the total cost of producing the nuclear engine is found. At each colony, some fraction of the energy produced is dedicated to consumer goods, and some is dedicated to strategic projects the player or their ministers initiate. When a project is being budgeted, the system breaks it down into components, finds the cheapest method of getting each component, and presents the player with the optimized price. If the player is so inclined, they can drill down to see why the cost of each option is what it is, or they can just make their decision based off the summary numbers. 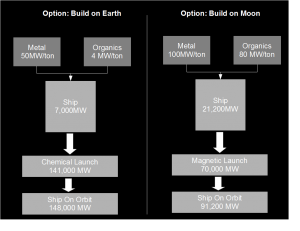 Figure 3: Despite the considerably higher cost of Metals and Organics in the airless and harsh environment of the Moon, it can be cheaper to build spacecraft there because of the low cost of launching those spacecraft from the Moon’s shallower gravity well. Because the energy requirements for different materials varies depending on the planet and the facilities available, it can make sense to build different components in different places. 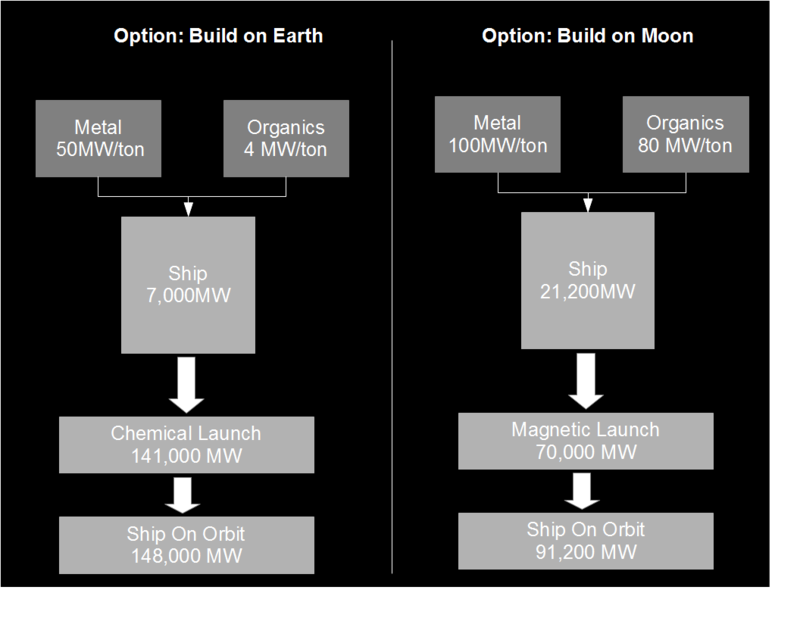 In our final image, we can see that despite the fact that it is much more expensive to get metal and organics on the Moon than on Earth, it can be cheaper to build on the Moon, because the extra cost is made up for in the launch of the spacecraft. The numbers shown in these examples were just for the sake of illustration — they shouldn’t be taken as final game values. The complexity shown here will also be obscured by default. When a player takes an action, they will simply be told the final amount of energy it will cost the colony footing the bill. The drill-down to find out why the cost is what it is, and how they could theoretically reduce the cost by building new facilities or choosing a different construction site will be present, but not shown by default.